An empty beach in Sanya on southern China’s Hainan island. Last weekend, the Hainan Rendez-vous draws China’s glitterati to the city of Sanya on the shores of the ‘Chinese Riviera’. It’s regularly claimed that Sanya is China’s answer to the French destination of Cannes — but how do the two stack up? Most visitors to Cannes arrive through Nice, though it’s also a nice drive from the airport at Marseilles — either way, getting there directly isn’t particularly easy. Sanya, by comparison, has a rapidly expanding international airport served by countless Chinese carriers and some international names including Hong Kong Airlines and Korean Air. 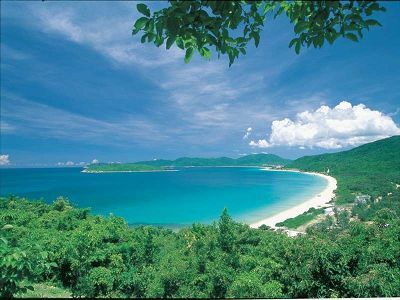 Hainan has a tropical monsoonal climate, with lows of around 16 degrees C and a pronounced rainy season in the summer. It’s hotter and stickier than Cannes, which has a Mediterranean climate that ensures long, warm summers with a refreshing wind but cooler winters. Both destinations offer a superb choice when it comes to luxury shopping, although you’re more likely to be doing it inside a shopping mall in Sanya — the place is full of them, offering everything most people could possibly want to buy under one roof. It’s a world aware from the bustle and charm of Meynadier Street, but the tax incentives offered by Chinese authorities will easily tip the balance in favour of Sanya for the thrifty. Haute cuisine is easy to come by in Cannes, as the town boasts two two-star Michelin restaurants and two one-star establishments, as well as a host of other top-rated establishments. Don’t expect anything quite so flashy in Sanya, although the arrival of lauded chefs to hotels such as the Mandarin Oriental has helped secure some much-needed international kudos for the town when it comes to fine dining. Luxury hotels in rapidly developing Sanya will soon far outnumber those in Cannes, with names such as Ritz-Carlton, Banyan tree and Mandarin Oriental among 13 five-star properties already open for business and plenty more building built. On the French rivera, the scene is rather more low-key thanks to Cannes’ relatively small size — there are just six five-star establishments, including the Hotel Majestic Barriere, the InterContinental, the JW Marriott and the Hotel Martinez. In Cannes, the Promenade de la Croisette stretches the length of the Mediterranean seafront, separating the beaches and luxury yachts of Europe’s mega-rich from the hotels and restaurants of the town. On Hainan, Yalongwan bay stretches for 7.5 kilometres in a crescent shape — it’s slightly outside of Sanya proper, but it’s home to crystal clear waters, stunning Coral reefs and shorefront woodland dotted with resorts. Cannes is an obvious winner here, home to a selection of high-profile international events including the Cannes Film Festival, several museums and theatres and a host of villas open for public perusal. Over 10 million tourists flocked to China’s most popular beach destination last year, the vast majority Chinese — around 500,000 visitors were foreign, reports suggest, and of those approximately 100,000 were Russian. China’s massive population makes it something of an unfair comparison, but Cannes doesn’t perform too badly, pulling in around two million visitors every year.